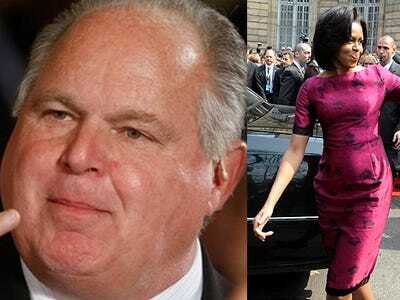 Rush Limbaugh says so many idiotic things over the course of one week it’s hard to get too worked up about it. But Limbaugh appears to have stepped over the line in the last week, essentially calling First Lady Michelle Obama fat in response to her anti-obesity plan. And it doesn’t look like he has any intention of stepping back even though he has apparently pissed off some of his listeners (presumably this isn’t the first time). One said listener called in today to complain and ended up calling Limbaugh a coward. Loudly. Limbaugh is standing strong though! How come it’s OK to tear Sarah Palin to pieces, he wants to know, but when he simply notes that Alex Rodriguez would never date Michelle Obama he gets torn to pieces. I am entirely confident that along with any number of others thing Rush said today, this is entirely not true.